Includes Key Machine, Key Blanks and Key Rack. We've put together some of the best key cutting packages in the industry. 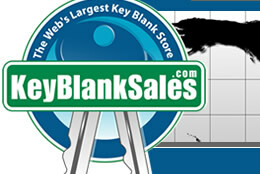 Choose your key machine and you'll also receive 20 of the most popular key blanks and a key rack. Choose packages catered to automotive, boat, equipment, furniture, motorcycle, property management, RV & camper and the truck & tractor industry. Light Duty, Manually Operated Key Machine. The Mini Speedex® is a lightweight, industrial-grade duplicator, and is one of the most accurate small key machines on the market. Its size and weight make it ideal for use in small or mobile lock shops. The 4-way jaws hold a large variety of different key blanks, including double-sided automotive keys. The expansive carriage range accommodates large-bow keys. Lightweight, Compact, Portable… this mechanical, edge cut key duplicator model is an ideal choice for on-site, mobile jobs or counter tops where space may be limited. The Flash 008 will easily duplicate most edge cut cylinder, cruciform, large bow and long blade keys; including the larger, oversize style automotive keys. Medium Duty, Manually Operated Key Machine. The Premier Speedex® is a dependable, manual duplicator, equipped with a heavy-duty motor. The 4-way jaws hold a large variety of different key blanks, including double-sided automotive keys. The expansive carriage range accommodates large-bow keys. The reversible tracer allows you to cut flat steel keys with the optional slotting cutter kit (No. CW-16KIT). Heavy Duty, Manually Operated Key Machine. Heavy Duty, Lever Operated Key Machine. Once keys are loaded, the spring loaded carriage is engaged by the press of a button. The lever is then moved manually to control the carriage movement during the cutting cycle. The Speed 044 Semi-Automatic is loaded with features that any user will readily appreciate. Heavy Duty, Automatic Operated Key Machine. 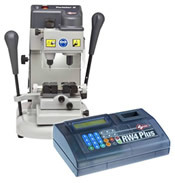 The Speed 040 is primarily an automatic model that also provides the flexibility to be operated manually when desired to duplicate edge cut/flat style keys accurately. The Speed 040 is the perfect choice for the store or shop wanting the versatility to choose between automatic or manual operation. This versatile operational mode combined with the modern, open style and many additional features will provide users with years of service. The Bravo III is a high precision, heavy duty semi-automatic key machine designed for ultra-reliability and ease of use. The durable cobalt steel cutter ensures a smooth, clean, accurate cut. The Bravo III is designed to duplicate common cylinder and automotive key blanks as well as Titan®and older GM® with 90 degree first cut bitting characteristics. An operators “dream machine”, the KD50C is superbly engineered with numerous features to deliver quick results with exceptional precision and accuracy. With the KD50C just a flip of the carriage lever lets the operator duplicate a key with unbelievable speed and ease in as little as 5 seconds. This model duplicates standard type residential, commercial, padlock and automotive keys quickly and accurately – without adapters! The KD50C is loaded with features that make it the “machine of choice”, regardless of operator experience.